Those are my first note worthy legendary item. Got them from an act 4 bounty bag. 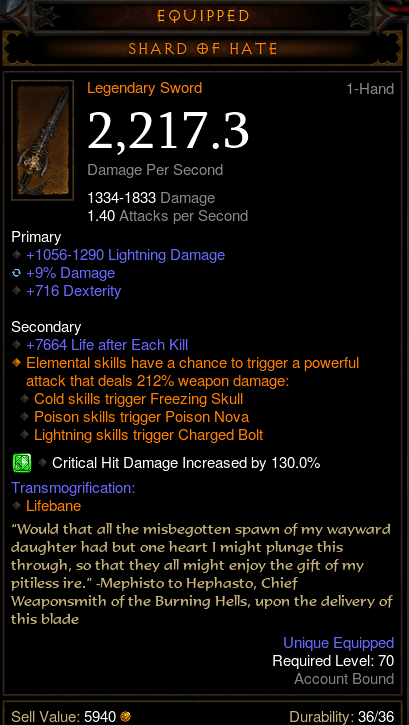 I have not had the chance to enchant a socket on this yet but check this out! 29% chance to Chain Lightning enemies when you hit them. I think I will replace the Area Damage with a socket. I wish I could change the Vitality to Intel as well. I found my first two level 70 legendary items last night! I am using the staff as my current weapon, but I am not using the amulet right now. I got a lot of items recently from opening 100 Horadric Caches but I have to say my new favorite item is Mad Monarch's Scepter. I found this Skorn last night. I might give this to my Crusader and let him enchant the Intel into Strength. I found two level 70 set plans last night. One was Sage's Journey and I think the other one was Aughild's Rule. I also was able to craft a Hallowed Baton because I found an Angelic Shard. Now I just need to get enough Forgotten Souls so that I can enchant a socket onto it. Kalada just hooked me up this morning. I've been buying chest items for awhile and after at least 3 buys where I filled my toon bag with chests I got a blackthorne chest!!! 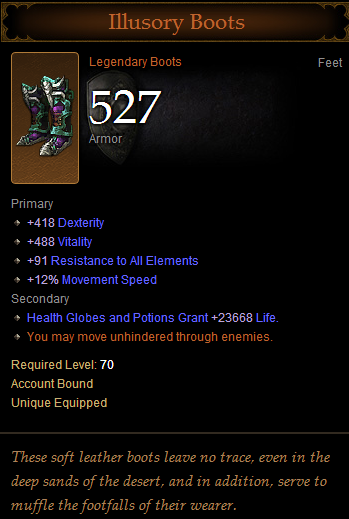 Running in HC so I have not made it to torment yet, so this is my first set item. Will post pic tonight. Rolled decent, although it rolled with monk ally + damage. I re rolled that once and stuck with the +15% sweeping wind modifier. Seems good. I found my first legendary source over the weekend! I found 3 keepable legendaries last night! This amulet is really cool. If an elite has arcane beams I travel from arcane beam origin point to arcane beam origin point soaking up the healing! I found the plans for Fleeting Strap (Attack Speed belt!) and for the Guardian's Jepoardy set last night. I also found these new bracers which I am actually wearing because they are better in every way than my old ones. This popped out of a regular chest like 2 minutes into my Saturday play session! This is the current source I am using. I was so happy to find the level 70 version of the pre-patch source I loved so much. I got these items a few days ago I think. ALL SHALL BOW DOWN BEFORE MY EPIC MOONLIGHT WARD! It is a natural trifecta (that I can enchant into a perfect trifecta by increasing the crit damage to 100%!) and it rolled 318% percent on the special effect out of a possible 320%! I finally got my first legendary (not my first bounty bag only legendary, my first legendary) from a bounty bag. It ended up being an item you can only get from a bounty bag. I got the Gloves of Worship. It did not roll well, but I may keep it when I want an XP shirine to last for 10 minutes. @mentok1982 Can you use the gloves like the nemesis bracers? Just put them on to get the effect and then switch back afterwards? As long as you are not in a really challenging difficulty, you should be fine for 10 minutes with less DPS. If the shrine buffs your attack speed, toughness or reource regeneration the DPS loss will be less of an issue. Thought I just had to share this with the world. Increase your Life per Second by up to 100% based on your missing life. Vault gains the effect of Rattling Roll rune. Poison Skills deal 16% more damage. I thought the reduction of control impairing effects was interesting, 40% is pretty significant. I don't have a poison build for my WD, currently my gear is centered around Fire. Plus, I found Corpse Spiders to be utterly useless on D3: RoS (I used to use it in Vanilla D3). Finally got my first Shard of Hate, now I need a Thunderfury! I CANNOT wait to get online again! Warning for all...Learn plans ASAP..I had 3 of the same drop in 2 pack kills..
Because of its 250 Intel set bonus when used with my Chantodo's Force it does not lower my DPS too much when compared to my Gift of Salaria (2,351 DPS) sword. I am still using my sword for now though. This is my second Vyr piece. I already have the gloves. When there are 5 enemies within 12 yards of you, gain an absorb shield for 22% of your maximum Life for 6 seconds. This effect may occur once every 30 seconds. I kept this because I want to test the special property. 15% chance on being hit by an Undead enemy to charm it for 2 seconds.